Visit Ireland's beautiful green countryside, listen to Celtic Folklore of Magic and Elves and 'a Pot o Gold'! Our Irish tours offers the largest selection of escorted bus tours around Ireland - with over 20 different itineraries of different lengths. Choose value-for-money first class hotels or splurge with deluxe properties. AND, all of our Ireland tours feature most meals, including specialty dinners with lively, traditional Irish entertainment. Daily sightseeing is prepaid and included. Yes our tours are 'All Inclusive'! Another great reason to visit Ireland - and Frommer's Guide in 2011 voted Ireland the 'Favorite Holiday Destination' in the world! Come visit Ireland, you'll be glad that you did! 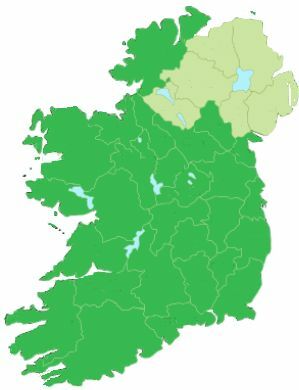 The map of Ireland at the right shows the Republic of Ireland in darker green [Gaelic Eire], it's Capital is Dublin is independent of the UK, and is a Constitutional Parliamentary Republic. Northern Ireland is in the lighter green, is one of four countries of the United Kingdom. Northern Ireland's Capital is Belfast, and a Constitutional monarchy Consociationalism, a sharing of power/duties so to speak and Northern Ireland Office to oversea it all. When visiting Ireland today, you can visit all of Ireland including Belfast, now at peace, is a most interesting to visit and learn about. There is no doubt that the friendliness and welcome that you receive when visiting Ireland is like no other country. The Irish are very happy that you're visiting their country, learning about their history, culture and customs. While enjoying a very witty and fun and experienced tour guide to include their Celtic terms and traditions and much more, and insight into their history and future. Ireland is at long last peaceful, and great experience to savor. Whether you're going there to learn more about your Irish Ancestry, or just to see the country for the first time, it will be a true learning experience for you. Escorted all-inclusive tours are the way to go, with first class lodgings, meals and sightseeing that is all included. CIE Tours offers the largest selection of escorted coach tours around Ireland - over 20 different itineraries of different lengths. Choose value-for-money first class hotels or splurge with deluxe properties. And should you opt for a more Independent means of travel or a Self-driving tours, that is easily arranged as well and quite popular. Contact us today by phone or request form. The first time Notre Dame and Navy faced off in Dublin, Ireland was 1996, and a very exciting event! These two rivalries -- Navy and Notre Dame have played annually since 1927, and one of the longest continuous sequence in college football. These two rivalries do not come any better, and in 2012, their rematch, will be the event of the season in the brand new Aviva Stadium in Dublin Ireland! Notre Dame vs. Navy Football Game - for more info on Celtic Tours then call to book your travel! Aviva Stadium having been built on the grounds of the Lansdowne Road Stadium and is the home to the Irish Rugby Union team and the Irish National Soccer Team. Aviva Stadium is one of the finest venues in the world, few stadiums anywhere have attended to the detail, aesthetics and fan comfort as in Aviva Stadium. Celtic Tours fans who travel to Ireland to attend the Notre Dame vs Navy game will also enjoy the beauty of Ireland for an unforgettable experience. The Notre Dame vs Navy game is scheduled Sept 1, 2012, please contact us now, early reservations are advised in order to protect against exchange rates and to be assured of admission. 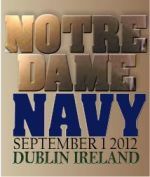 Contact Us Now to reserve your guaranteed spot at the Notre Dame vs. Navy, 2012 game in Dublin, Ireland! some have limited availability. Tickets to the game are the primary venue, and you need to book as early as possible to guarantee tickets and lodging. We can always add two or three days of golf or sightseeing to any tour package. Your tour starts in Dublin and getting settled into your hotel early in the morning. That afternoon join a local guide for a tour of ancient and modern Dublin. Drive through the main streets to see historic buildings such as Trinity College, where the Book of Kells is housed; the evocative figures of the Famine Memorial; and rows of Georgian houses with gaily-painted doorways. Stop at Dublin Castle for a guided tour through the elegant State Apartments, which are filled with elaborate Waterford Crystal chandeliers and portraits of prominent Irish leaders. Departing Dublin to visit Blarney Castle and Killarney. Travel through the midlands of Ireland, which has many mixed farms, stopping for photos of the stately ruins on the Rock of Cashel, continue your drive south and a visit at Blarney Castle to kiss the famous “Stone of Eloquence.” Also visit the Blarney Woollen Mills where you can find quality Irish-made goods and arriving in Killarney, picturesquely set beside lakes with Ireland's highest mountains, the Macgillycuddy's Reeks, forming a backdrop. Next is the Ring of Kerry and Skellig Experience, embarking on Ireland's most popular scenic drive of 100 miles - the Ring of Kerry. This winding route reveals breathtaking sights of the Macgillycuddy's Reeks as well as coastal views of beaches and cliffs. Drive through the village of Cahirciveen and cross to Valencia Island by bridge. Visit the Skellig Experience to learn about the nearby rocky islands where early Christian monks lived in austere conditions and today they form a thriving bird sanctuary. Stop to walk around Sneem, where brightly-painted houses are grouped around a central green. Pause at Moll's Gap for a view of the Three Lakes of Killarney with the town in the distance. Upon leaving Killarney and driving north to Tarbert for a 20-minute ferry ride across the wide River Shannon Estuary, your tour continues along the Clare coast to the Cliffs of Moher, a spectacular wall of limestone that reaches to almost 700 feet above the Atlantic Ocean. Drive past Lahinch Golf Course, one of Ireland's most famous, and through the marketing town of Ennis to Bunratty. Check in to Bunratty Castle Hotel, and a special evening in the 'Great Hall' for a medieval-style feast of excellent dishes and plenty of wine. During and after the meal the lords and ladies will serenade you with song and harp music, evocative of the Middle Ages. There is no doubt that today's traveler might like to journey on their own, and that's what is so great about independent travel is just that, you can do your own thing. But the backbone needs of your tour are included, and that is the accommodations, the rental car, with all the necessities to get you to where you're going, and your options of types of accommodations, staying in a B&B or a Castle! All offer full English breakfasts, and we also offer Chauffer driven tours.and with this in mind we offer you Ireland and our directory for accommodations that includes over 1,000 B&B's throughout Ireland. Private shower/bath & bathroom are always included in our rates. Comprehensive auto insurance is always included in our rates and 'Airport Location Service Fees' are always included in our rates. We'll mail you comprehensive vacation support tools, including a B&B directory, guidebook, map, discount book and more. Stay in a real family home to experience a friendly welcome from Irish homeowners. You have the freedom to decide where to stay and you can choose from a variety of different town, countryside and farm locations. All bed and breakfasts are owned by the B & B operators themselves, who usually live on the premises and bring a different perspective to hospitality. Get to know the people, culture and region and learn about local traditions. Enjoy a full Irish breakfast with great local produce. And at these B & Bs, the B & B owners will help you find the greatest restaurant in town, the liveliest pubs, the most interesting tourist attractions and local amenities. Your Self-Drive Ireland Vacation Includes a Hertz self-drive car for 6 days or longer with unlimited mileage, based on 2 or 4 people traveling together. With 80 years of travel excellence our Ireland Travel Tour Operator has won numerous industry awards, their track record and reputation for customer service speaks for itself! If you have a group of 10 or more travelers that wants to do something special, we can create a custom Group Tour just for you. Our 'Group Department' can create or refine any itinerary to reflect your group's interests, needs, time frame and budget. The types of tours that we can offer are endless! Faith-based Tours of Ireland, Britain or Italy | Short Winter Spa or Pub Breaks | Pub and Music Tours | Tracing your Irish Ancestors | Ireland's Fun Golf Courses | Ireland's Nobel-winning Writers | Britain's Great Gardens | In the Footsteps of Chaucer and Shakespeare | Jane Austin's England | Scottish Clans & Castles | Harry Potter's England | Golf in Scotland | Gourmet Italy | Italy's Great Cathedrals | Wines of Tuscany | Dalmatian Coast - 101 Highlights | Prague - Europe's Hot Destination and much more call today at or contact us through our GROUP INQUIRY FORM. here is no doubt today that modern Irish cuisine compares with the very best in the world. Furthermore, it excels in showcasing the very high quality of Ireland’s natural, fresh, locally-produced ingredients. Experience the creative and culinary talents of Irish chefs on offer in luxury establishments as you travel around the island of Ireland. While you travel, enjoy the spectacular scenery and intriguing history that Ireland has to offer. Read on for more details. Accessed via Dublin Airport (slight adjustment required for those entering via Shannon Airport) and departed via Shannon Airport, this gourmet tour includes overnights in some of Ireland's Premier 5 ***** Hotels, Castles & Country Manor Houses. All of your hotels are noted for their exceptionally high standards of dining, all offering the option of tasting menus (advance notice required. The rates quoted for this tour include the one main evening meal in each hotel although a small supplement will apply should you wish to partake of their tasting menu. Of course, when booking this tour, should you wish to forego one or more of the evening meals, a reduction in the price will result. Your route will allow you to visit many of Ireland’s most popular sights including the Monastic Settlement at Glendalough and Powerscourt House in Wicklow, Waterford Crystal and the Kennedy homestead in the South East, Blarney Castle and Kinsale in County Cork, Killarney and the Dingle Peninsula in County Kerry, the Cliffs of Moher and the ‘Burren Landscape’ of County Clare as well as the Rock of Cashel and Cahir Castle in Tipperary. Accessed via Dublin Airport (slight adjustment required for those entering via Shannon Airport) and departed via Shannon Airport, this gourmet tour includes overnights in some of Ireland's Premier 5 ***** Hotels, Castles & Country Manor Houses. All of your hotels are noted for their exceptionally high standards of dining, all offering the option of tasting menus (advance notice required . For accurate information and quote, a valid phone number and email address are required. Thank You. We'll email you and call you back within 24 hours after receiving your request. Rest assured that we'll do our best to make your Irish Travel Experience a great one! Please fill in all the requested info, as it is necessary to help you with travel inquiry, and please check your SPAM and JUNK folders for a reply from French at a Touch travel services. Thank you for visiting French at a Touch, and have a great day!